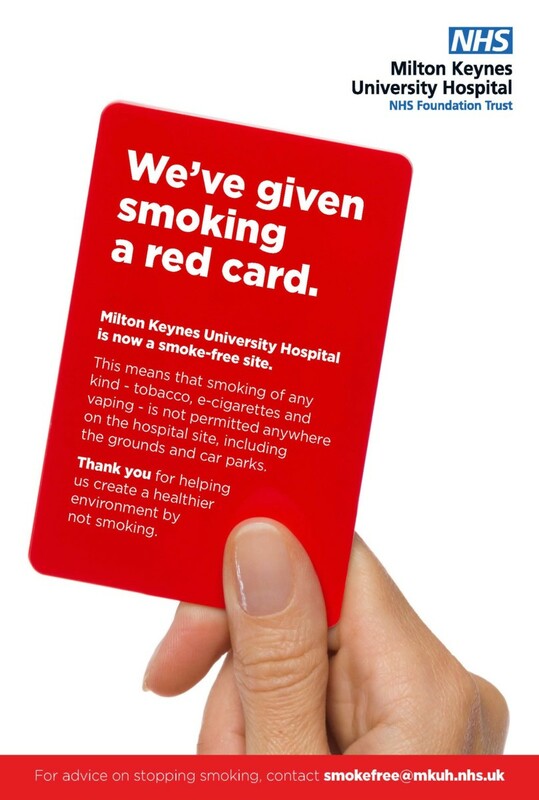 Milton Keynes University Hospital is now an entirely smoke-free site. As a result, patients, visitors and staff are not be permitted to smoke anywhere on the hospital grounds. This relates to all outdoor areas, including the car parks. The move is in line with the hospital’s ongoing plans to contribute to improved public health and wellbeing. All forms of smoking – tobacco, e-cigarettes and vaping – are no longer allowed. “The harmful health effects of tobacco smoke are well documented and it is clear from the feedback we have received that smoking in public areas on site is something that is no longer acceptable to the majority of our patients, visitors and staff. From 1st October, the hospital’s outdoor smoking shelters will be removed. A public awareness campaign, focused on giving smoking the red card, has been launched to help promote the ban. Staff who currently smoke and who wish to give up will be encouraged to attend special stop-smoking workshops which will be held every Monday in the Maple Unit. There will also be a dedicated stop smoking team on-site to provide the appropriate advice to all visitors to the site. If you would like to find out more about our smoke-free campaign, please email [email protected].